Web Series Today: Alex Jones exposes a bazaar connection to lonelygirl15? Alex Jones exposes a bazaar connection to lonelygirl15? In a bazaar twist of fate, renowned conspiracy theorist, Alex Jones recently connected the dots between occultist Aleister Crowley and an evil cult that might parallel the Order in lonelygirl15 . 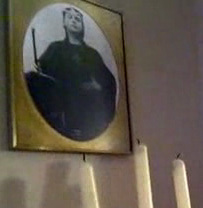 Many of you will remember the picture of Aleister Crowley that was displayed in Bree's bedroom. "They treat me better than you do. Yo, I'm having the best time here. We had pizza, I had ice cream. We even did spin art. How cool is that?" Now you maybe thinking that all of this is just coincidence. But, we all know that their is no coincidence in the Breeniverse. If true, does this may mean that Alex Jones is about to expose the existence of the Order?